If you have a home loan backed by Fannie Mae or Freddie Mac and have been affected by the devastating California wildfires this month, you may be in line for some financial assistance. To date in November 2018, the fires have claimed the lives of 44 people and destroyed at least 100,000 acres including thousands of home and other structures. It is reported that as much as $2.6 billion in residential properties are at risk in the Butte, Camp, Hill and Woolsey fires in California. Current reports show that Camp Fire is now the deadliest fire in the history of the state, killing 42 people and burning 7000 structures. Most of these buildings were residential homes. In response to this alarming threat, Fannie Mae and Freddie Mac are reminding home owners and servicers of various mortgage assistance options for victims of these devastating fires. 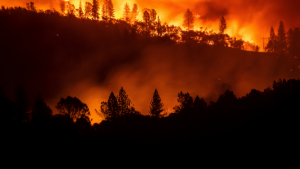 According to Carlos Perez, Fannie Mae’s senior VP and chief credit officer, the firm’s thoughts and prayers are with the families that have been affected by these wildfires. Fannie Mae mortgage holders who have been affected by the fires may be eligible to stop making their mortgage payments for up to one year. During this 12 month period, they will not have late fees, nor will delinquencies be reported to the three credit bureaus. Perez stated that Fannie Mae and its assorted lending and servicing partners want to ensure that mortgage assistance is available to those in need during this very difficult time. It is vital for home owners in the at-risk areas to focus first on their safety. Perez urged homeowners that have been affected by the fires to get in touch with their mortgage servicer for help. Freddie Mac borrowers who live and work in areas that have been declared to be major disaster areas by the president also have access to federal assistance programs, and they are eligible for disaster relief funds from Freddie Mac. But in areas where FEMA has not made individual assistance available yet, mortgage servicers have been encouraged to use Freddie Mac’s short term forbearance programs for people who have been affected by the fires. Freddie Mac has stated that the safety of people in the path of the fires in California is the top priority. The organization stated this week that once they are out of harm’s way, Freddie Mac encourages homeowners whose houses or workplaces have been affected by the fires to get in touch with their mortgage servicer to learn about various mortgage relief options. Mortgage servicers are allowed to suspend or reduce your mortgage payments for up to three months without contact with the homeowner, if the servicer thinks the home’s owner has been affected by this natural disaster. Mortgage servicers are required to suspend foreclosures and other legal proceedings if the loan servicer thinks the home owner was affected by the disaster. Mortgage servicers should not report delinquencies or forbearance caused by the disaster to the major credit bureaus. California has been facing a major outbreak of as many as 16 wildfires this fall that span the state. More than 4,000 firefighters are fighting the fires, which have destroyed thousands of homes and could destroy thousands more. In Southern California, 20,000 home owners had to evacuate this month. The biggest fire right now is the Mendocino Complex Fire, which has burned more than 305,000 acres in Northern California as of November 16, 2018.